As a child I was fascinated by roller skates. I thought how cool it would be to roll everywhere so fast. Granted, we didn’t have any concrete or sidewalks to speak of in our entire community, but still, a kid could dream. Though I’ve outgrown my desire to roller skate everywhere, this time of year I often have the sensation that I need to be roller skating through life just to keep up! If you’re like me, I curl up with a good book to slow down the holiday frenzy. The activity centers me so that I can rejoin the fray in a better frame of mind. The truth is I don’t have as much time to read as I used to have. These days I volunteer more in my writing community and my local community. I miss reading several books a week, but I enjoy helping others and feeling useful. It all depends. Sometimes a visit from someone you haven’t seen in a long time can be the best gift of all. Nothing wrong with getting a nice wrapped or homemade gift either! Winner(s) announced! I like to award multiple prizes when I have more than 10 entries, so 2 lucky readers will win a print copy of Gone and Done It. My winners are qofnilesblog and Jeanne Schutts. Congratulations to the winners. Everyone, please visit us again and also remember to sign up for newsletters to keep apprised of our latest releases and sales. In Jr High we used to go to the roller rink every Friday night. One time I fell and ran over my hand and sprained my finger. I love getting homemade gifts from my niece and nephews. That sounds painful, Jeanne! I hope it healed up nicely for you. I love homemade gifts too! Hi Rosemary, I feel your face-plant pain! I love how you much you value homemade gifts and visits from family. Good luck in the drawing. I’d love a visit from a loved one as a treat. I make handmade treats for others. Hi Pat, So nice to have you visit here at Booklover’s Bench. I’m in awe of you making handmade treats for others. You are a Wonder Woman in my book! Wishing you luck in the drawing. A visit from a loved one would be a treat. Hi Dona Mae, I’m sure your loved ones enjoy visiting you as well, and I hope you get many such visits this coming holiday. Best of luck to you in the drawing. As for gifts, as you get older you don’t need more “stuff” and the doctor’s say cut down on the sweets. 🙂 I’d much rather have a gift of time spent with us or us going and doing something together. After all your time is the most precious gift you can give. You can only give it once, fits all sizes, doesn’t wear out or break, and is good for the soul. Thanks for the wonderful chance to win a copy of “Gone and Done It”. I’d love the opportunity to read it. Hi Jolie, How nice that we have that shared experience of enjoying rollerskating as a kid! Let’s hope you have many visits from family and friends this holiday season. Good luck in the drawing next Thursday morning! I love gift-wrapped presents! The anticipation of discovering what is inside, knowing that someone cares enough about me to thoughtfully pick something out… it’s a delicious feeling! I do love spending time with those I love, though, too!! Hi Lady Scud, I know just what you are saying as you sit there and hold a gift wrapped package. Anything could be inside. It is so fun to ponder those possibilities. Wishing you luck in the drawing on Thursday morning! I do like opening gifts, it’s always nice to be surprised. However, I usually buy what I need for myself during the year, so every year I tell my Sister that I would really like an Amazon gift card. So gifts are nice, but visits from family and friends is always nice too. Gift cards are a great way to go for those of us who aren’t particularly crafty or who chronically run late on time. Thanks for stopping by Booklover’s Bench and entering the drawing for Gone and Done It. LOL, I love the idea of skating, but the reality is less happy, mostly because the whole gliding thing creeps me out (I don’t ski, either). But skating at the indoor rink was huge for birthday parties when I was a kid. I can still hear the “clash, clash” sound of a bunch of kids on skates making their way around the rink. Isn’t it interesting how sounds and scents get wound tight in our memories? I remember hearing the roar of skates but the music was so loud you couldn’t really talk and it mostly blotted out the rollerskating rink sound. I don’t know if I could skate today. My balance isn’t what it was 50 years ago, and then there’s my so-called friend, Vertigo, who is not nice at all. If it’s my kids, I’d rather have them visit than anything else. Otherwise, I love getting an Amazon gift card so I can buy the Kindle books on my wish list. As for skating, when I was a kid I did ice skating on the local lake. Never got into roller skating at all but it can be good exercise for the leg muscles. HI Nancy, I’m glad for the invention of gift cards. 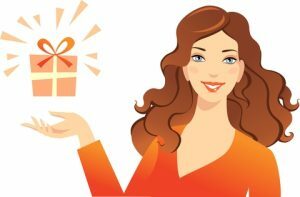 As a giver of gifts, it is often hard to find the exact thing that someone wants and/or needs, so a gift card certainly comes in handy. I also enjoy receiving gift cards to my favorite places. I enjoy kid visits too! What an honest person you are, Kara. Most of us do crave visits from our loved ones. Some people don’t even recognize that emptiness they feel as the void of family. Thanks for visiting. I would love the surprise of what is in the wrapped present and the anticipation of a gift to follow. Anticipation is so powerful. That is also what keeps me turning pages in a book! I would like a visit. A surprise visit would be even better. I live so far from my family so the only time I see them is when I fly up to MA even though they have an open invitation to visit us here in FL and we are near the beach and have a pool. Maybe someday. I love the excitement of opening a gift-wrapped present and who can resist delicious homemade treats? But I’m at the age where I need to start getting rid of stuff, not acquiring more. And holiday treats wreak havoc with my Weight Watchers goals. Therefore, I choose the visit. We get so busy, it’s easy to lose touch with people you love and enjoy. Like you I enjoy opening gifts and eating homecooked meals. Visits are best for my stage of life as well. BAck in the 80s, when skating rinks were popular, we used to go all the time as a family thing to do. With scattered family, we have very little frenzy. We also (except for the grandson) have stopped exchanging seasonal gifts. Rather, we give things as needed throughout the year. I love that you give back by volunteering. Family is important. I’m reminded of that every day, and I am motivated to give back to the community because I have had so much help along the way. Up here in the north, we have ice skating. Always loved it as a child, but one of the things I’m not supposed to do any more. And gifts? I love gifts of all kinds. A visit is especially wonderful, and home made is always nice. I thought ice skating was harder than roller skating, just as snow skiing was harder than water skiing. I guess its all what you’re familiar with. For the record, I’m not planning on going ice skating or roller skating anytime soon!